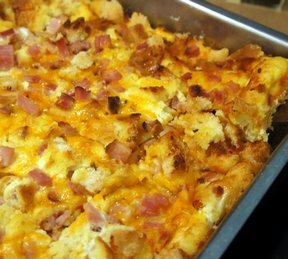 Delicious ham and cheese breakfast bake. 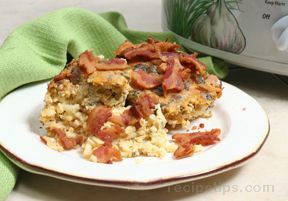 Perfect for holiday mornings or morning entertaining. You make it the night before and bake it in the morning...done. No fuss, no mess. Lightly grease a 9x13 inch baking pan. 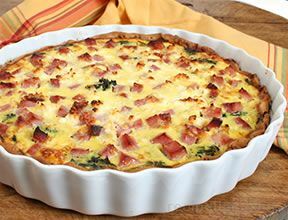 Toss bread, ham and cheese with flour. Place in prepared baking dish. 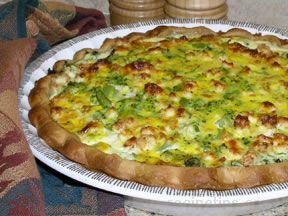 In a large bowl, beat together eggs, milk, salt, hot sauce, dry mustard, butter and green onions, if desired. Pour egg mixture into pan. Preheat oven to 350 degrees F (175 degrees C). Bake covered for 40 minutes. Uncover and bake for 20 more minutes until eggs are set.